"You must first of all understand that although I seem to be talking about an historical event, everything of which I speak is within you and is happening at this moment. Your body is the Virgin Mary. The Spirit is Christ, the Word that was conveyed through Gabriel the eternal messenger. The breath is the Breath of the Mercy of God, and it is that breath that quickens the soul. Until the soul is quickened by the Spirit it is like an unfledged bird. There are many paths to God, but the way of Mary is the sweetest and most gentle. If you can melt into Mary, the matrix, the blueprint of life, the Divine Mother, you will be formed and shaped in Christ and Christ in you, and thus through the breath of God's Mercy you will come into being and know Him. For it is the breath of mercy that bestows being. Every moment God appears in living form, never manifesting twice in the same moment. Mary brought Jesus into the world because she was chosen to be the one for this work, and so she was trained in the knowledge of birth. It is said that Gabriel, the messenger, appeared to Mary in the form of a man. She thought that he wanter her as a woman, so she froze for a moment, turning to her Lord. If she had not relaxed, then the child born from that moment would have been uncompromising and impossible to live with. Mary is the Divine Mother. Mary is the blue of the flame, and Mary is the matrix of all divine possibilities in form, here in our world. It is necessary that she be recognized. Learn to love God with all of your being, every part of your self, your heart, your mind, your soul and then we may all be granted the understanding of the meaning of virgin birth. Learn to pray and your prayers will come back from the very matrix that forms the child. A sufi is called 'the son of the moment.' As you melt each moment into Mary, something is being redeemed that a child may be born, and what is being born is the son of the moment. That child may become God-realized and thus be called a Sufi or he may walk the earth unaware, asleep - not yet human, not conscious of God or of the wonders of His creation, having no knowledge of himself and thus no understanding of love. Your body is the Virgin Mary - remember this each moment of your life. This is the responsibility that we must take as we come into knowledge, into being. The eternal messenger is always within, wanting to unfold the moment through the Word, and one day when Mary is recognized again, there will be a reappearance of Christ, manifested in the outer world. 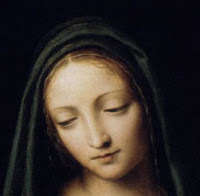 Remember who Mary is, and one day when you are ready, and when God so wills it, you will know what I have told you." Human soul is receptive in nature, which is the feminine aspect. Sufi path of love is essentially feminine because it incorporates longing and receptivity. To fall in Love with Divine "with all your heart and with all your soul and with all your mind" says Jesus Christ as recorded in Bible, is a feminine quality of loving surrender. Thus each self or human spirit bear witness to its feminine quality of receptiveness, like Mary. The more receptiveness it attains by becoming pure, becoming virgin in the metaphysical language - the more potential it holds to receive the Divine Breath and give birth to a new soul, the Christ. With self-realization and Divine surrender such alchemy of soul happens, light enters into the receptive vessel, it becomes pregnant with love of God and finally gives holy birth to the new self, the Christ. Although newborn, yet the new self beholds timeless wisdom that comes from true realization. This is the esoteric impression of Quranic verse mentioning Christ's wisdom in his cradle. "He shall speak unto mankind in his cradle and in his manhood, and he is of the righteous." - Quran 3:46. Also it follows, "And Allah teach him the Book and Wisdom, the Law and the Gospel" Quran 3:48 ... the gnosis of Jesus came directly from the Divine, no human teacher transmitted what was transmitted to Jesus. This also points to the esoteric mystery that in reality the Real Teacher has always been the Divine. 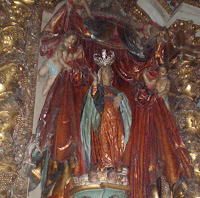 "Virgen de la Esperanza" (Virgin of Hope). photo of the statue of Virgin Mary rarely portrayed as pregnant, at Santiago de Compostela, Spain. credit to Barbara who shared the photo during her visit to there.